In Burma, New Years is celebrated during the second week of April. The exact date changes every year and is calculated with the traditional Burmese lunisolar calendar which in turn is based on the movements of the sun and the moon. These days the New Year celebrations are called Myanmar’s Traditional New Year Festival, Myanmar’s Traditional Water Festival or simply Thingyan. 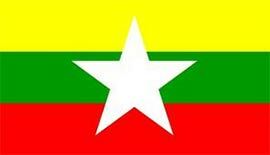 Myanmar is the new official name of Burma, even though the country is still better known as Burma. 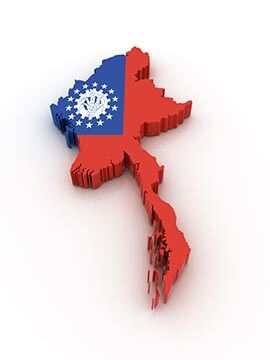 Poverty in Myanmar is extensive and the country is ranked as one of the least developed countries in the world. A strict military regime runs the country sins 1962 and many bloody riots and even civil wars have taken place since then. The army is both big and powerful so all opposition is resisted. In spite of this, Burma is an amazingly beautiful country, filled to the brim with friendly people. During the Myanmar Water Festival, and actually during the whole month of April, all citizens are supposed to be extra happy and at ease. For four days before New Year’s Day the tradition claims that everybody in Myanmar shall splash water on one other in order to cleanse for the New Year. Myanmar’s Thingyan could be compared to Thailand’s Songkran. Both are New Year Festivals with lots of water splashing and both happen in April. Other similar celebrations take place in Laos and China. The word Thingyan means “moving from one thing into another” and the Thingyan Water Festival has been celebrated for more than 500 years. It is a festival deeply rooted in the Burmese people’s hearts and all of Burma’s citizens take part in the festivities. The tradition to splash water during the New Year celebrations exists in most Southeast Asian countries. In Myanmar the people believe that all the sins they have committed during the past year can be cleansed away with the water that’s thrown on them by their fellow citizens during Thingyan. All sins and disillusions are washed away from body, mind and soul and the New Year can start with a purified existence. April is Burma’s hottest month, so being splashed with water all days long is more a relief than a burden. Any clothes will dry fast under the ruthless sun. During the Myanmar Water Festival small stages are set up along the streets of cities and small towns. On these are groups of students or representatives of the state armed with buckets full of water. When a vehicle or person passes in front of these stages they are drenched with water. It is an act of kindness and much appreciated by all. On the bigger stages traditional Myanmar Thingyan dance shows are set up. On a more spiritual level the Burmese belief says that an old king, Thagyamin, appears during the four days preceding Thingyan, to measure all Myanmar’s citizens good and bad thoughts and actions during the past year, a kind of karma declaration. People decorate their doorsteps with leaves and flowers to welcome the God. Thagyamin leaves the earth on the morning of the third day which is also when the New Year is rung in. During Thingyan the younger generation of Myanmar’s population will wash the hair of the elders as a sign of gratitude and respect. Another custom is to buy live fish and then release them in the open waters of rivers or lakes on the last day of the Water Festival. The main religion in Myanmar is Theravada Buddhism and according to it killing any living creature is a sinful act. If you travel to Myanmar during the New Year Water Festival you should know a little about the traditions and celebrations. Water is being thrown everywhere and on everyone, you’re by no means safe just because you’re a tourist. The Burmese people feel they are dong the tourists a great favour by splashing them with water and thereby purifying their souls. The temperature in Myanmar at this time of year is most of the time higher than 40 degrees C so for most people getting wet is not much of an issue. Appropriate clothing during the Thingyan Water Festival is a hat, t-shirt, thin trousers, flip flops and a towel near at hand is quite handy. It is important to wrap all electronic equipment such as cameras, video cameras and mobile phones in plastic; otherwise they are likely to be destroyed. Copyright © 2019 SongkranFestival.com - All rights reserved. Siam Sunflower Co., Ltd.